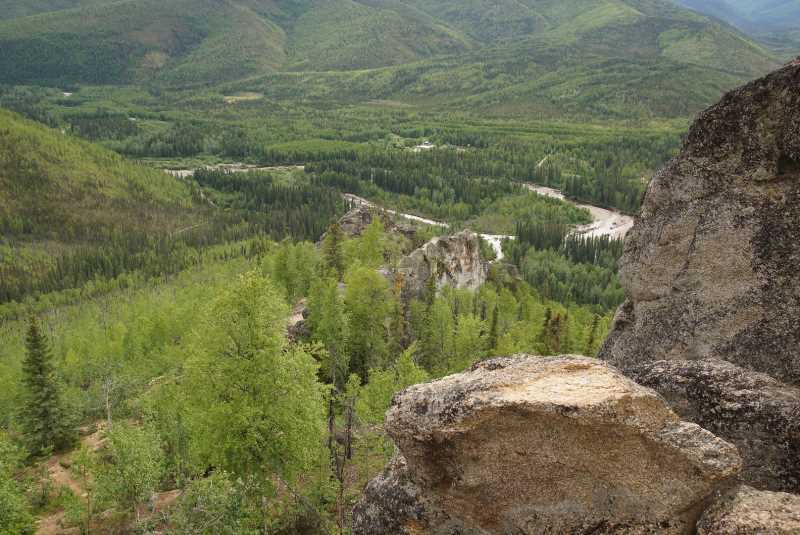 You could never finish hiking all the trails that Alaska has to offer. But, if you find yourself in Fairbanks, and you’re looking to stretch your legs, your options are few. The area surrounding Fairbanks is pretty flat. 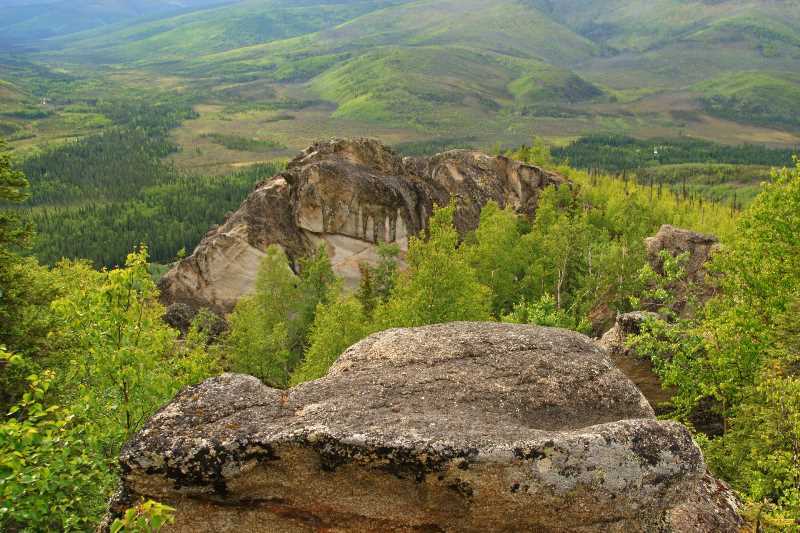 If you want a good trail that gains elevation and takes you to some excellent viewpoints, you’ll need to drive a little, out to the Chena River State Recreation Area, and the Angel Rocks Trail. 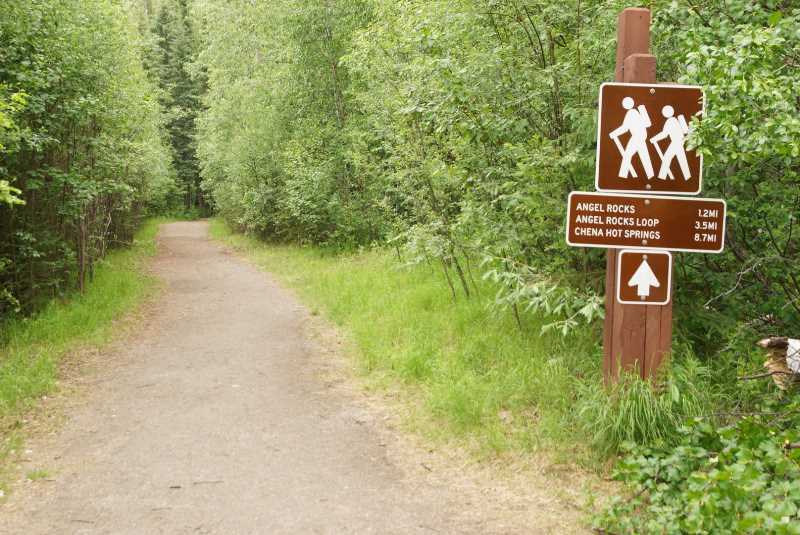 There are several trails in the Chena River SRA, but most are all-day adventures. Angel Rocks, on the other hand, can be hiked and properly enjoyed in a few hours. It’s a 3.7 mile lollipop-shaped loop that includes a moderate, 900-foot elevation gain (add on extra for rock scrambling). The downside to Angel Rocks Trail is the location. 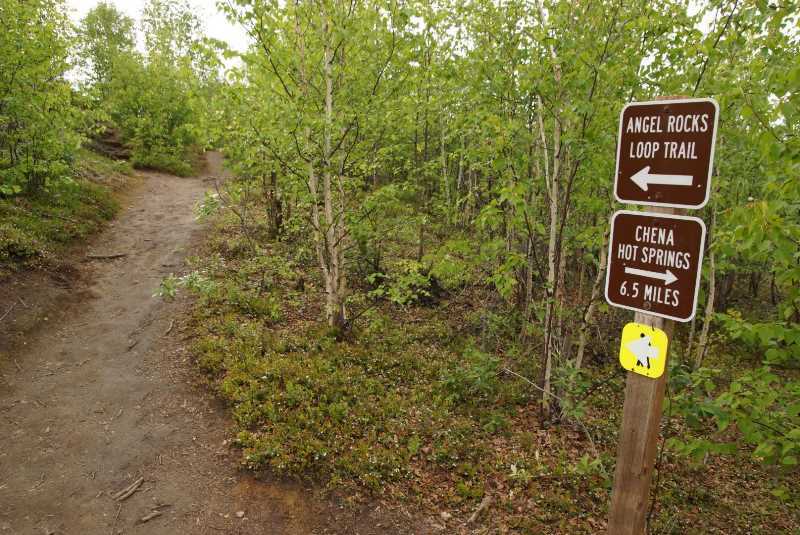 The trailhead is located at mile 48.9 on Chena Hot Springs Road. In other words, it’s almost 49 miles away from the Steese Highway, and 53 miles from downtown Fairbanks. The drive is easy, two-lane paved highway, but it can be boring. 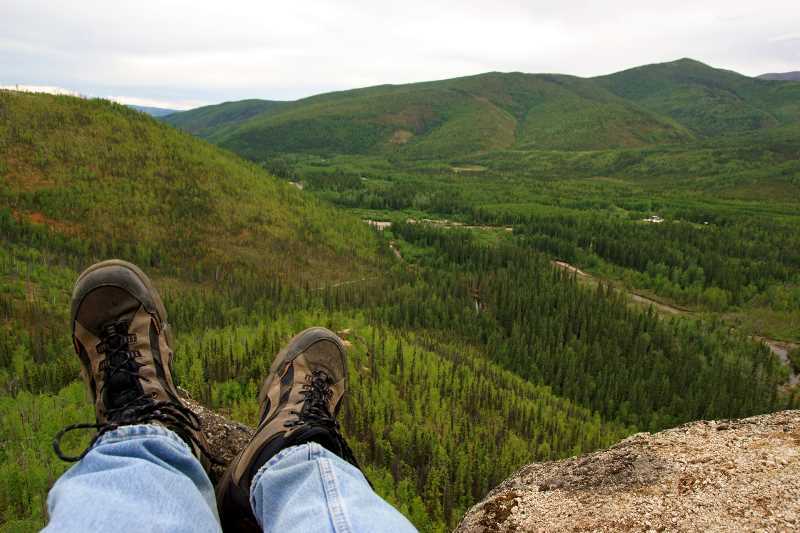 When I stopped at the visitor center in downtown Fairbanks, shortly after arriving in the city around mid-afternoon, I asked for a good hiking recommendation. The Angel Rocks Trail was at the top of their list. At the time, the 53-mile drive out to the trailhead didn’t seem like a big deal, so I decided to give it a try. For a trail that gains a lot of elevation, at least it gives you a nice, easy start and finish. 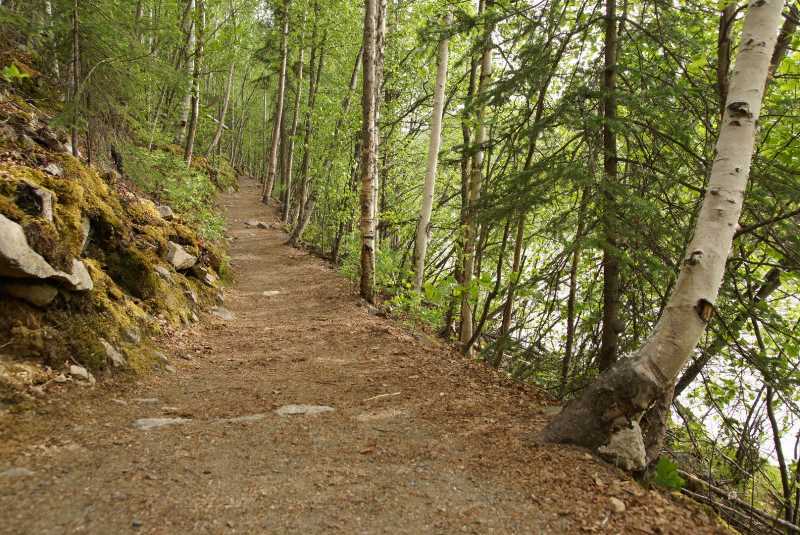 The trail hugs the edge of the North Fork Chena River for the first 8/10 of a mile (and also the last 8/10 of a mile, since you’ll take this same trail to return to the parking area). … before the trail heads away from the water. 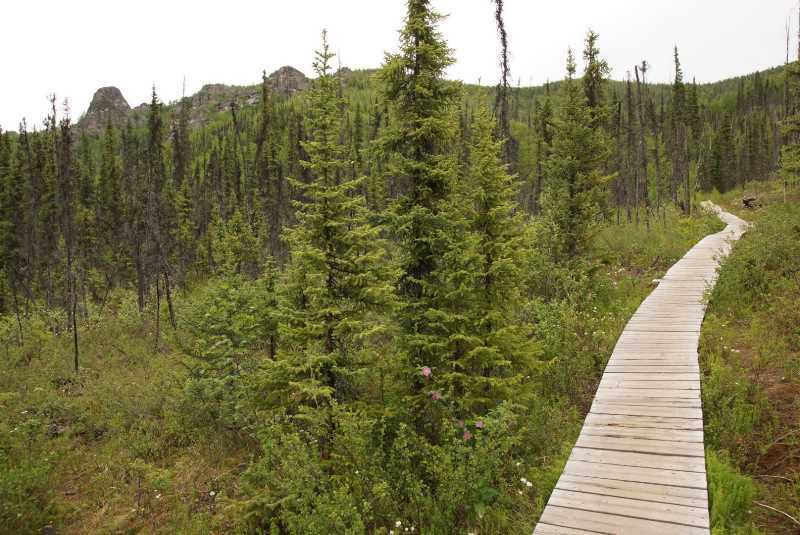 First, a boardwalk takes you across a swampy area, and then you start the climb. When the trail splits, stay to the right for the quickest access to the good viewpoints. 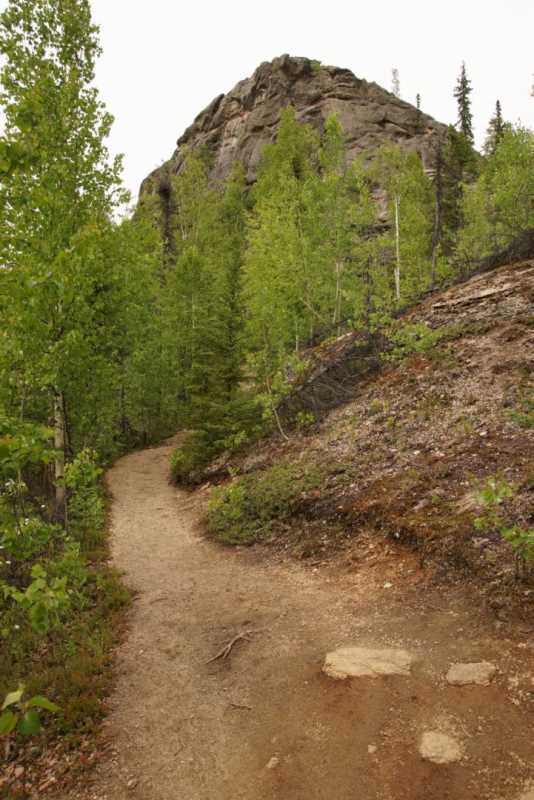 There is one official trail, but also plenty of other short paths that lead out to viewpoints. 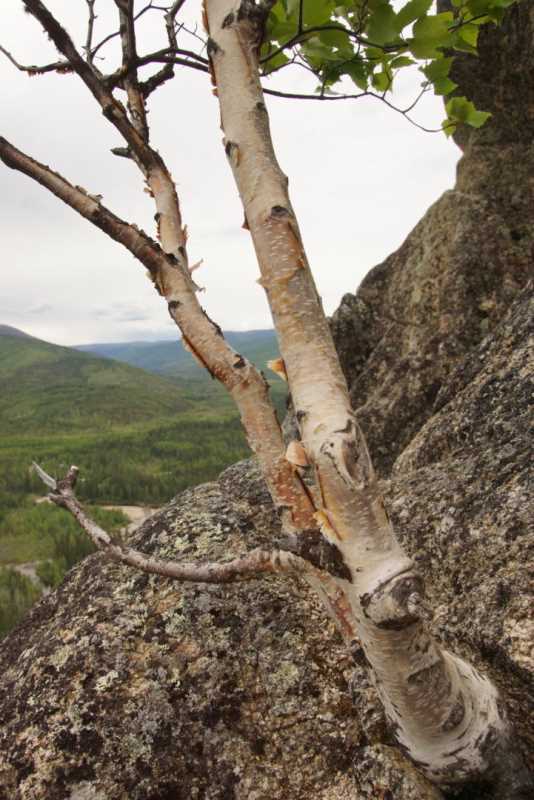 … provides a nice perch, from which you can view the Chena River valley. Even on more crowded days, this trail provides so many different viewpoints, you should have no trouble finding your own. You’ve got to admire this tree! It’s growing straight out of the rock. I used it as a hand-hold, to swing around to a narrow ledge, for a nice view. …the valley was lush and green, and quite beautiful. 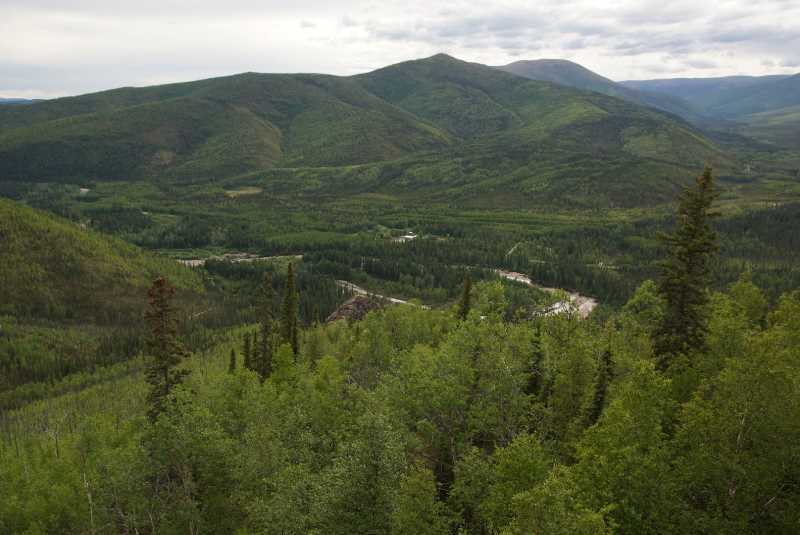 Looking across the valley, I think you’re looking towards Chena Dome. There’s a 29-mile, 2-4 day loop that circles this area. 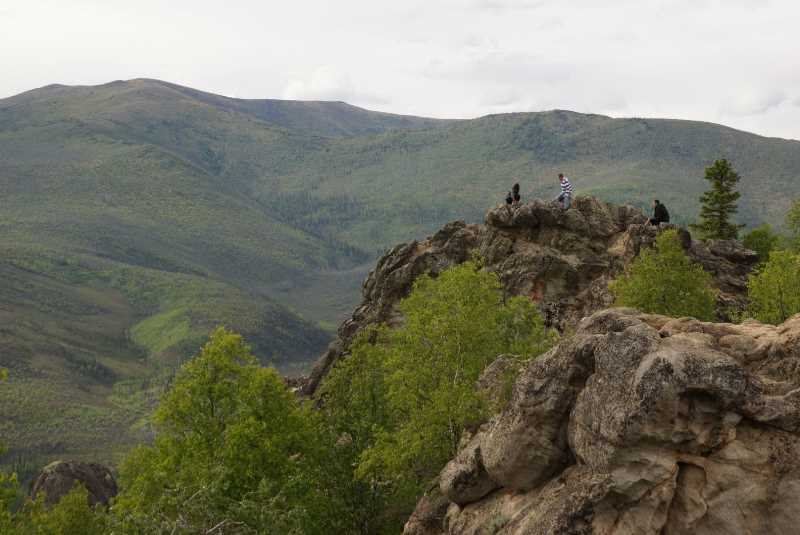 You can also hike part of the trail as an out-and-back day hike. Once you’ve reached the high point on the trail, and you’re sort-of behind the outcroppings, you arrive at a junction in the trail. 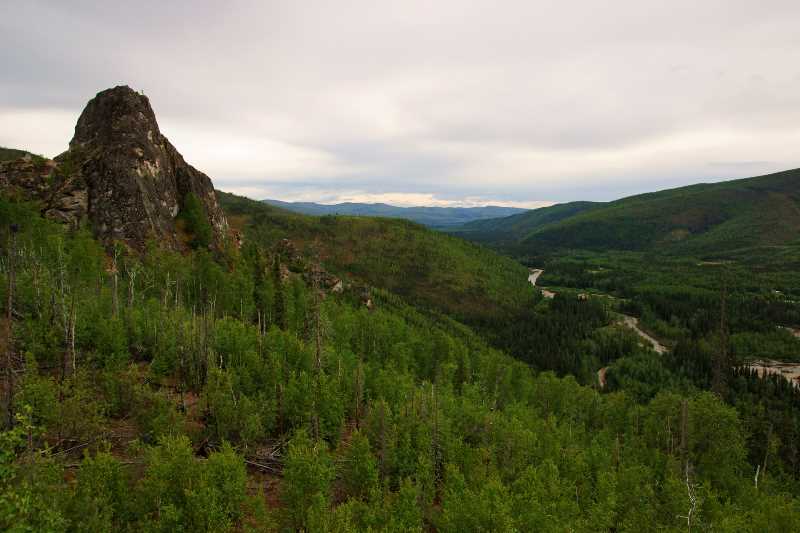 You could keep hiking towards Chena Hot Springs (another 6.5 miles from here). 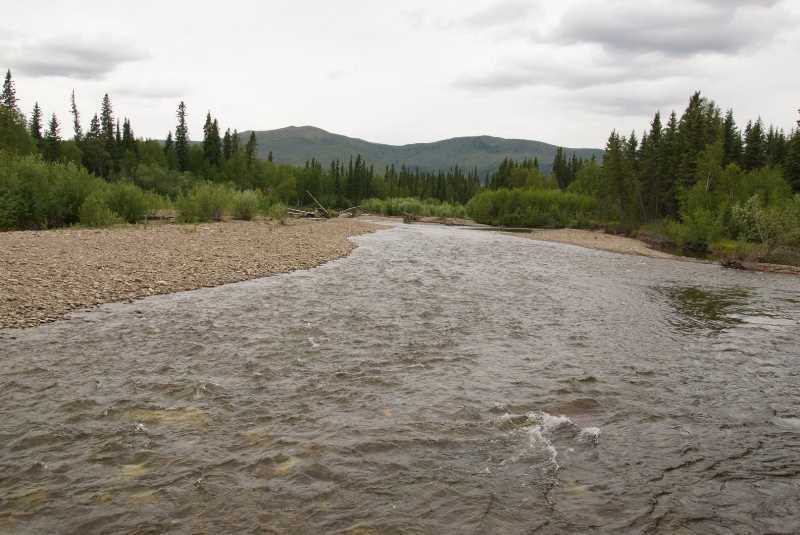 But, keep in mind that you can also drive to Chena Hot Springs. It’s at the end of the road, a few miles beyond the Angel Rocks trailhead. Instead, continue on the loop trail, for the long way around, down, and back to the riverside stick of the lollipop. … and more good views of the most prominent outcropping. But eventually, the trail heads downhill, and closes the loop. For the first several days in Alaska, I had pretty good luck with the state’s infamous mosquitoes. I even started to think that, perhaps, I was immune to them. All that changed on this trail. The riverside portion of this trail was a feeding frenzy of bloodsuckers. I pulled a hoodie tightly over my head and covered my arms and hands with my sleeves. They still managed to take a pint or two out of me. I’m not sure if even the strongest insect repellent would faze them, but be sure give it a try. 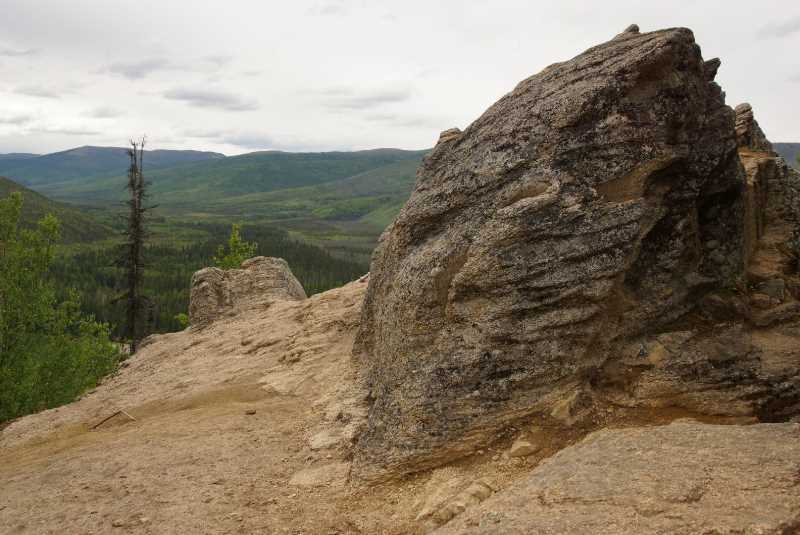 Here’s a look at the drive out to Chena Hot Springs and the Angel Rocks Trail.